It’s been a month or so since our last report and that reflects the reduced number of anglers who are now fishing. Nevertheless, the majority of those that have visited have had successful outings. While the weather has been a bit mixed, anglers continue to report trout taking a variety of dry flies, though more recently the trout have wanted the fly in or just under the water rather than on top. Black again had been the dominant colour. 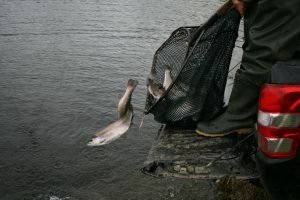 I should mention that during one of the warmer days’ anglers reported seeing a large number of flies on the water, but the trout were not interested. Instead, Mallards could be seen going with the wind, eating these flies off the water! Buzzers continue to be an enigma, with the trout not really interested in them, but still taking dry flies. Perhaps it was something to do with the depth they were being fished at? With the recent cooler weather, a Hot Head Damsel has been successful, while other anglers have had various success with lures; Montana, WSW & Cat’s Whisker. 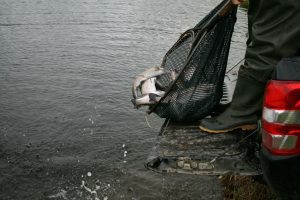 Anglers have also reported that having found a lure or nymph that had attracted a fish to 2, the trout seem to go off and anglers then found that changing the fly had success. Weird! As we quickly approach the middle of Autumn with colder, wetter (either rain, sleet or snow) then we can expect the trout not to be rising so freely; that’s until someone proves me wrong. However, sticking my neck out, I would suggest that nymphs/damsels, together with traditional and lures will attract most of the fish in the coming months. Still, if’s it a warm, sunny day with little wind, then I would ensure that I have a dry fly or 2 lurking in my fly box, just in case. Those interested in numbers, the best basket in recent days has been 17, all rainbows. Best rainbow was reported to be 6 lbs. Some nice brownies have continued to be caught and released, varying from ¾ to 4 lbs. You might also like to know that today (28 Oct) had our first snow flurry, so winter might be a little sooner that we expect! The photographs show a recent stocking. Finally, Sharpe’s of Aberdeen (www.sharpes.net) have given us a couple of the new 4-piece Ajax 10′ and 9′ 6″ # trout rods as demonstration rods. If, after, trying them, you’d like one they’re available at Artloch.